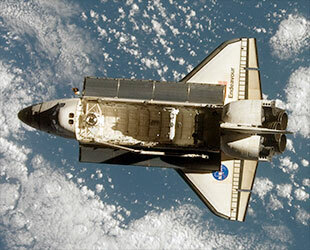 — Before undocking from the International Space Station on Tuesday, July 28, the STS-127 crew on space shuttle Endeavour transferred to the orbiting outpost an estimated 1,200 pounds of water that the orbiter's three fuel cells generated as a byproduct during their 11 days together. The power-providing units will continue to supply water for the seven shuttle astronauts until they return to Earth, targeted for Friday morning, weather permitting, but one crew member also kept stowed a small, but very special set of water samples for the ride home. Mission specialist Julie Payette, who together with space station flight engineer Bob Thirsk set a record for the first time two Canadians have been in space at the same time, launched with the water to symbolize the partnership that humans share with planet Earth. "We managed to convince NASA to bring little ampoules — they are really small, about half an inch — and in there, there is a drop [of water] from all the five Great Lakes and the three oceans that surround Canada: the Arctic Ocean, the Pacific and Atlantic," shared Payette during a preflight interview with collectSPACE. "It is afterwards going to be used in an exhibit in the Royal Ontario Museum in Toronto about water awareness and the importance it will play very soon in our lives." According to the Candian Space Agency (CSA), the water was collected over the past couple of years through the collaboration of its partners, including the United States' Environmental Protection Agency. As well as highlighting biodiversity, the samples' space flight marked the 50th anniversary of the St. Lawrence Seaway system, which is considered one of the world's greatest and most strategic commercial waterways according to CSA. The water packets were among the ten items Payette chose for her mission's Official Flight Kit (OFK), a duffle bag size container in which she and her crew mates, as well as NASA, flew items for organizations that supported the STS-127 flight and its astronauts. The OFK remained stowed for the 16-day, five-spacewalk mission that added the final component, an exterior experiment platform, to Japan's Kibo laboratory. As the kit's manifest lists, Payette also flew a replica of an astrolabe for the Canadian Museum of Civilization, a microchip engraved with the names of all recipients of the Ordre national du Québec, and a copy of Beethoven's Fifth Symphony for the Montreal Symphony Orchestra. 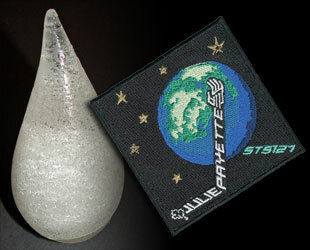 Water is also represented in the form of a resin statue of a droplet flown by Payette for the One Drop Foundation, a non-profit organization led by Cirque du Soleil founder Guy Laliberté. He will follow Payette to space when he flies as a privately-funded participant on Russia's next Soyuz to the station. Payette also requested for the Earth-human partnership be incorporated into the patch she wore on her suit in addition to the STS-127 crew insignia. "They were asking me what I like, you know, the little details and I said, 'the Earth', which is so impressive from space and I wish so many people could see it because it has a very big impression on how important a planet is to us, to our survival," she described. "The rest I said, 'Keep it simple, not too many things, too much hardware' and they did a superb job at representing the technical aspect, the robotic aspect but really our partnership, we humans with the planet. And that I am really, really proud about. Without being an activist, I really believe that it is really important." Filling the remaining 46 out of 85 slots set aside for the crew members in the official flight kit, are items chosen by Payette's fellow fliers. Mission specialist Chris Cassidy, who became the 500th person in history to enter space when Endeavour crossed 62 miles altitude after launching on July 15, is also only the second Navy SEAL to be an astronaut. "I'm flying things for my military command, the places I was assigned to in the Navy," Cassidy told collectSPACE. Among his flight kit items is a medallion for the National Navy UDT-SEAL Museum in Fort Pierce, Florida. Cassidy performed three of the mission's five spacewalks with Tom Marshburn and Dave Wolf. Marshburn, a former NASA flight surgeon and one of four medical doctors who were in space during STS-127, had fun requesting an item to fly from his high school, even if another astronaut sort of stole his thunder. "That was a lot of fun," he recalled, "walking up at my old high school to the front desk, introducing myself and just saying, 'I'd like to fly something to space'. But Eric Boe beat me to the punch, because he and I went to the same high school." Boe also flew something for Henderson High School in Atlanta, Georgia when he launched on-board Endeavour's previous mission, STS-126 in November 2008. Marshburn and Boe were not STS-127's only coincidental classmates: Wolf and commander Mark Polansky not only attended Purdue University in Indiana together but were once roommates. Their reunion in space inspired a show of school spirit. 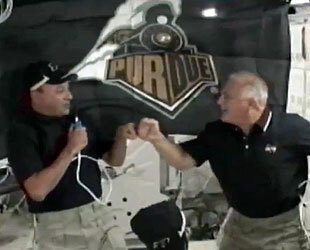 "We [took] two hats and a Purdue flag," Wolf said preflight and sure enough, the two alums appeared with them in a video they downlinked during the flight. Not everything being brought back was packed inside the official flight kit. Japan's first long-duration crew member, Koichi Wakata, who himself is returning on Endeavour after 138 days in space, has packed away special underwear that he wore for a month without changing. Part of an experiment, the trunks are part of a special set of clothing called J-ware that was designed to kill bacteria, absorb water, insulate the body and dry quickly. I wore it for about a month and my station crewmembers never complained for the month so I think the experiment went fine," said Wakata in response to the Associated Press. "I'm returning that and we'll see the results after landing." Should inclement weather at the Kennedy Space Center in Florida delay the underwear's return by a day, pilot Doug Hurley is ready with a distraction. "We get to fly [DVDs] with us," Hurley told collectSPACE. "I'm taking up the '79 Daytona 500, which is kind of when NASCAR first made it big as a nation-wide thing, and then the 1998 Daytona 500, which was where Dale Earnhardt finally won his first Daytona 500." "I told them that if we have a wave off day, we will have something to watch." The following is the STS-127 Official Flight Kit manifest, as provided by NASA. Inventory numbers that are missing indicate items that were removed prior to launch. Items 21 through 77 are manifested at the request of the STS-127 crewmembers. 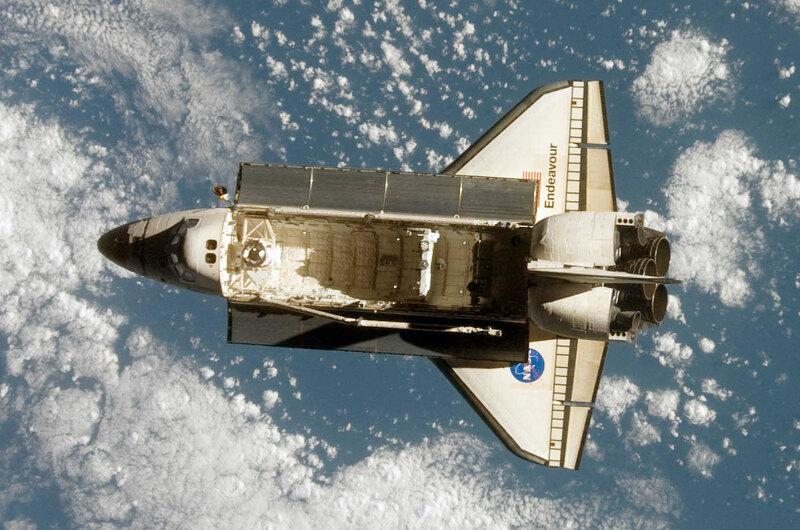 Items 80 through 85 are manifested at the request of the Space Shuttle Program Office and Payload Customers.